“Five weeks ago, Bill Clinton said ObamaCare is ‘the craziest thing in the world’ and voters must agree. “We’re pleased that businessman Trey Hollingsworth signed IWV’s ObamaCare Repeal Pledge to show his commitment to overturning this monstrosity, and we’re thrilled to congratulate Hollingsworth on his victory in Indiana. “Those who said ObamaCare no longer matters to voters are self-deluded. The more people experience its negative effects the more they dislike it—and rightly so. “The American people are tired of candidates who say one thing on the stump, then act differently when they get to DC. That’s why the Repeal Pledge matters to voters, and why candidates who support real reform, like Hollingsworth, sign the Repeal Pledge. “ObamaCare has never been popular with the American people—whether in polls or at the ballot box. 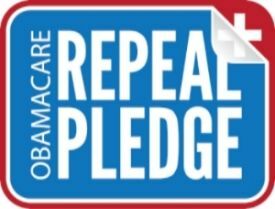 The ObamaCare Repeal Pledge was created as a trusted shorthand for candidates to show constituents their commitment to undoing this damaging law and creating a better system that helps all Americans. The power of this issue and this pledge was seen again tonight in Indiana." IWV advocates not just repeal, but defunding, deauthorizing, and dismantling the misnamed Patient Protection and Affordable Care Act. This victory moves us one step closer to better health care in this country. Congratulations to Trey Hollingsworth! For more information about the pledge please visit TheRepealPledge.com.